A cow moose and her two calves wander near the edge of Tuckamore Pond in Main Brook on the Great Northern Peninsula of Newfoundland, Canada. Wilderness is at its best in Main Brook, Newfoundland when you can watch a cow moose and her two calves wander freely throughout the wilderness. The cow must teach her youngsters the pros and cons of the wild and how to survive by themselves when they are ready to head out on their own. 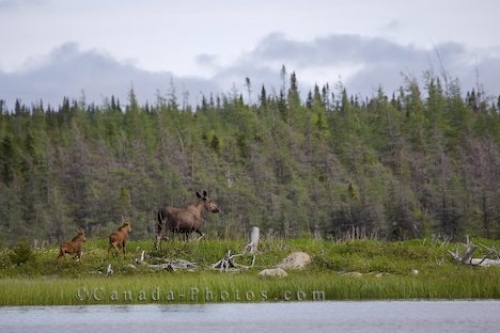 Picture of a cow moose and her two youngsters roaming through the wilderness in Main Brook, Newfoundland, Canada.